SEATTLE, Wa. 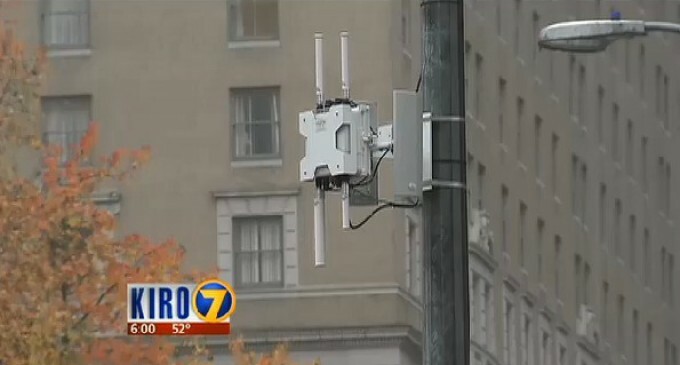 – The Seattle Police Department’s new “mesh network” blankets the town with an integrated grid of 160 wireless transceivers mounted on poles. Every time a wireless device looks for a WiFi signal, these nodes in the mesh network can recognize and record that device’s information. Police will be able to monitor and store data about the movements of any devices in real time – at a minimum. “Even if we assume that the mesh network was installed by good people for good reasons, there’s no reason to believe that the people controlling the network in the future will use it for the public good,” said Brendan Kiley of alternative news weekly the Stranger. “We need to have a serious public conversation and establish some very clear rules about how new surveillance technologies should and shouldn’t be used — with very real penalties for breaking those rules.” Kiley first reported on the technology Wednesday in The Stranger. “We believe that people should be free to move about without having the government track their movements unless there really is reason to believe they’re engaged in some criminal activity,” said Debelak. Seattle police could not explain why the network appears to be online. The network was bought with a Homeland Security grant for $2.6 million. A spokesperson for the city attorney’s office said a government affairs attorney is working with SPD to review the policy but there is no timeline as to when the review will be completed. Whoever is behind the scenes, whether local police, Homeland Security, or some other agency supposed to have your security in mind, it is a very good bet that your privacy will take a back seat to other official priorities. If you have any Wi-Fi capable device and are concerned about your privacy, chances are, you’ll be sleepless in Seattle. experience before they can successfully settle cases for millions of dollars.